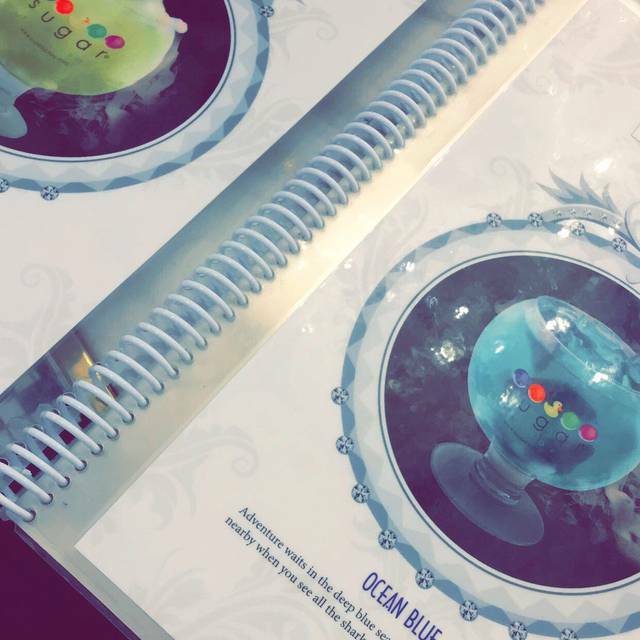 You must make reservations at least 5 minutes in advance of the time at Sugar Factory - Pentagon Mall. This is a fun restaurant. but don't go if you are in a rush. It's a tourist attraction and people do not seem to leave. We had reservations and still had to wait a half hour. Some of the people we saw when we first checked in were still at their tables when we left an hour later. The food was pretty decent. The best part of the restaurant experience is the birthday celebrations. You can tell when the staff is about to sing to someone because the house music volume gets turned up really loudly and the staff sing and dance to a different song each time. It's fun to watch and everyone in the restaurant seems to dance in their chairs and sing too. It's a fun place to go now and then, but, for me, not regularly. Awesome experience! Will definitely go back again! Our server was great. She took care of us in general. BUT we ordered a milkshake and a salad and the salad took a really long time. There were multiple large parties so maybe that’s why but it seemed like there was a lot of staff standing around. Mainly the decor/chairs looked very worn, which is surprising since this is a famous chain. The wicker chairs were unraveling and I changed my chair for fear I’d fall through it. They do have regular padded chairs though. The walls were dirty and overall the paint work inside looked faded. I’m comparing this branch to the one I went to in Connecticut, which was really flashy and neat. Come here for dessert but in general I’d skip it in future. My food was not cooked and had to send it back. So disappointed in the quality of food. Have had better experiences at other establishments. I was told the food was horrible. 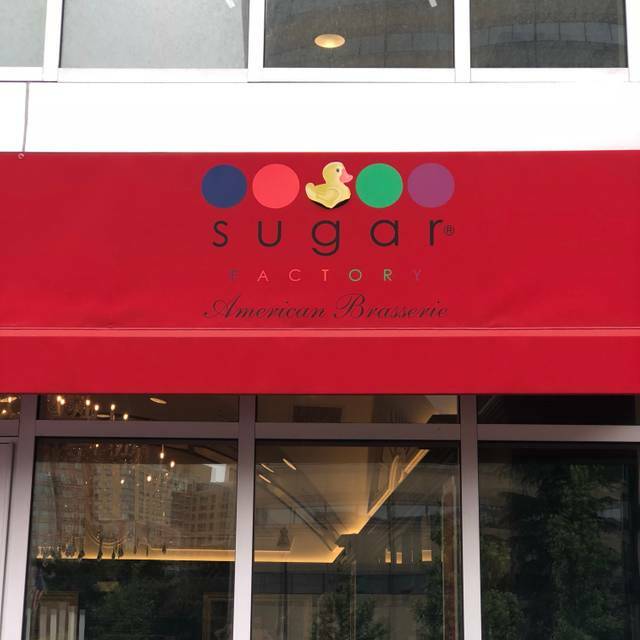 I wanted to experience Sugar Factory for myself. 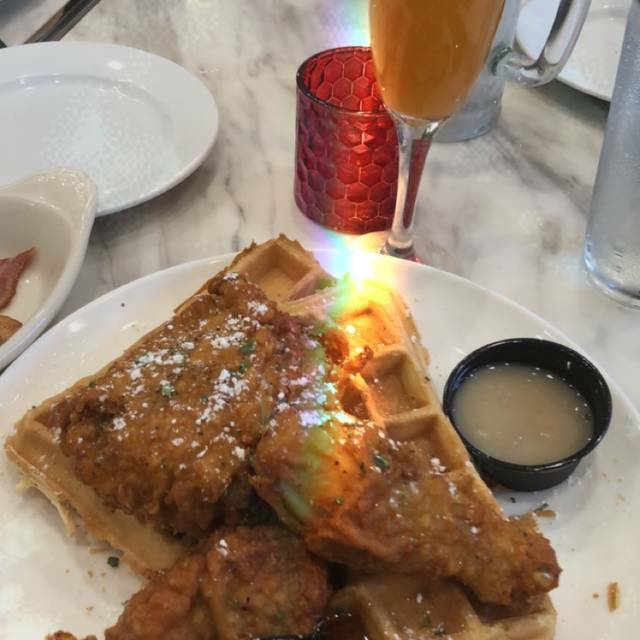 I order the chicken and waffle. The waffle was so hard. It was like eating an expensive eggo waffle. There is a difference between crispy and hard. When I mentioned it to the manager. 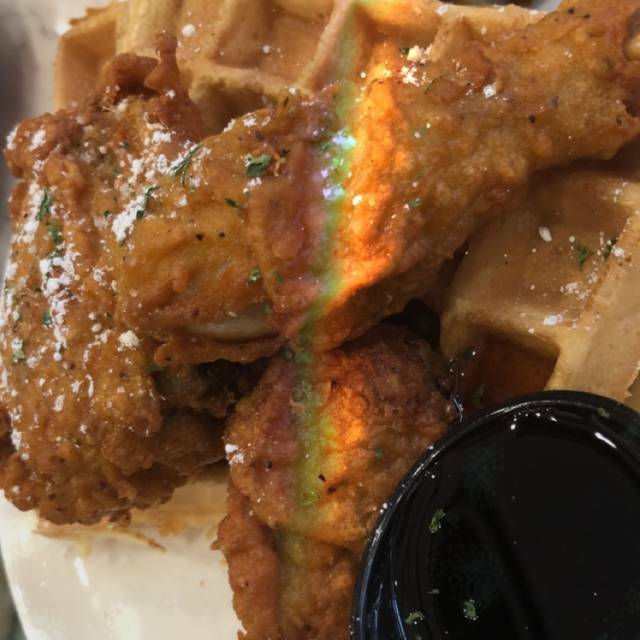 She said the waffle is suppose to be crispy. I could not use my utensils. She asked if I needed more syrup to dip the waffle in. Was she trying to give me diabetes. My daughter found hair in the middle of the hamburger. The manager said she would give a 15% discount because she ate some of it. (Ridiculous) Finally she said she would take the meal off the bill. There are so many negative reviews on your site. Sugar Factory it is time for you to make a change for the better. As of today. I will never come back. I would not recommend your locations. I recommend you spend your time and money at IHOP. The environment is fun and energetic m! We made reservations and waited an additional hour before we were seated. This was for my daughters 16th birthday also we waited but wasn’t happy with the wait time! Overall she had a good time. The atomsphere is LIVE! Definitely the perfect place for a birthday party. However, the food is average. The "signature" goblet drinks are expensive and are pretty weak. Overall a fun place though! The experience with my family and I were very disappointing. We tried to eat at a sugar factory in New York City back in September but due to traffic we missed our reservations. We were overly excited to finally find a sugar creek factory close to us and we were really looking forward to having the specialty drinks. We were disappointed with the drinks they were full of ice and frozen, and the wording on the cops were faded. This server tried to be nice but it was not genuine nor sincere. He continuously forgot to bring items we requested. We suggest that the servers have more training when it comes to customer service and that the restaurant orders and new cups! The new experience was nice. The food was amazing. I was really shocked. I was not satisfied with the hot temperature of the restaurant. I also think for the cost we spent, approximately 300 dollars, we would received better take home bags than the thin "thank you" bags. They were really slow. And restaurant wasn’t full. Leak in ceiling. Chairs falling apart. Logos scratched off of the goblet drinks. Not well kept and overpriced big time. This was one of the worst dining experiences I have had. 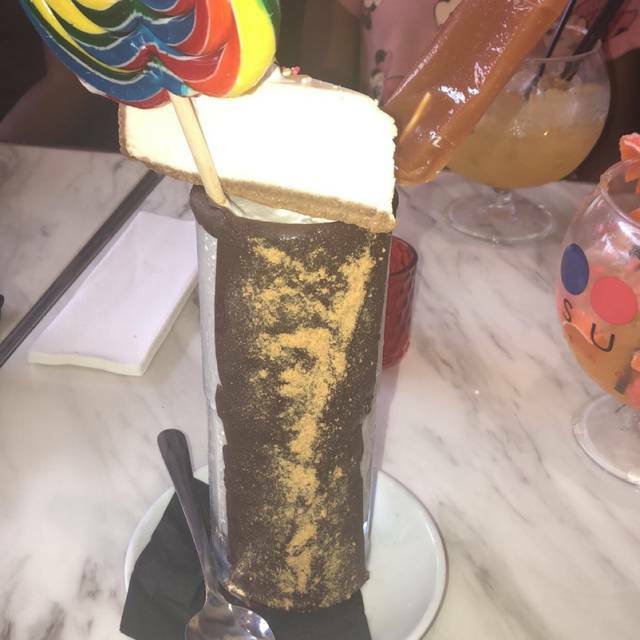 My teenage daughters found the Sugar Factory through social media and asked if we could go to experience the drinks and desserts. We were excited to have the opportunity to go during spring break. 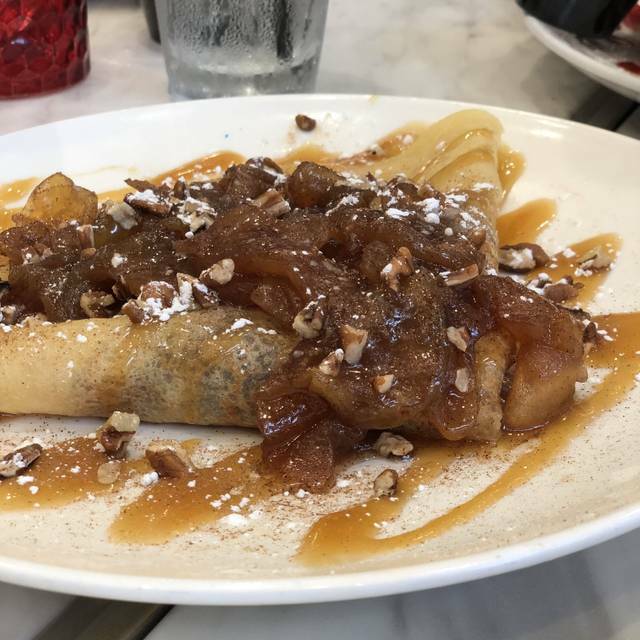 We went to the Pentagon City Sugar Factory and had a bad first impression. The dining area was not very full but we had to wait to be seated, even though we had reservations at 2:15 pm. After being seated, we aired 25 minutes without anyone ever stopping at our table for drinks or food orders. I had to go to the hostess stand to ask for a waiter. After 10 minutes a waitress stopped over and asked to take our drink order only. I said we were ready to order food and drinks. They brought us water in plastic solo cups, however everyone else in the restaurant has glasses to drink from. It took almost 50 minutes for our meals to come out. All we ordered were three hamburger meals with fries. It was nearly 90 minutes from the time we arrived before we had our food. The waitress came back twice, once to check on us and the second time to drop off the bill before we ate our sandwiches. The table beside us had a full explanation of the menu, asked if was their first time, and really sold the drinks and desserts. We had none of that. The whole purpose of us going was for the gurls to have the fancy drinks and a family dessert. Upon asking to speak to the manager, when she finally came over, she offered no apology for our experience, said she was aware that we had the issues from the start, answered her cell phone in the middle of me trying to speak with her, and was shocked when I said we came for the drinks and desserts but weren’t going to order any. She did not offer any service recovery until I persisted. She finally gave me 50% off our bill. 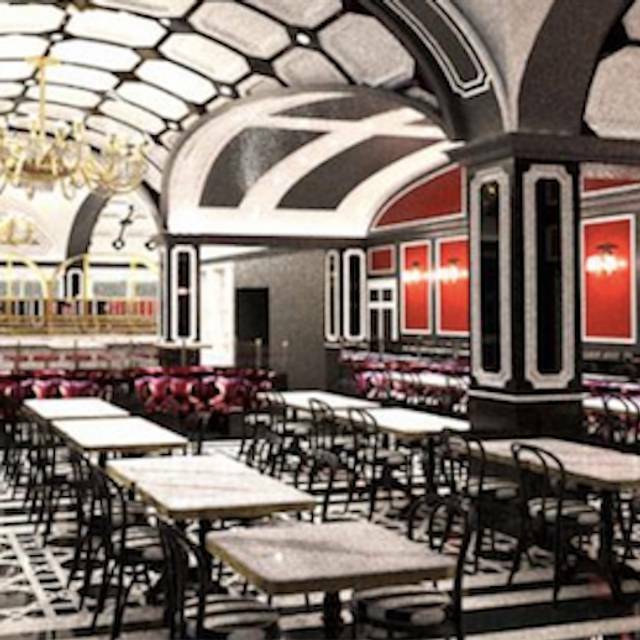 The Sugar Factory failed at the first impression, dining experience, and service recovery. The ambiance was extremely disappointing. I expected much more. The ‘waiting area’ was non existent. We had a reservation, and waited about 10 min for our table. This was reasonable, however there is absolutely nowhere to wait. The restaurant was not clean, tables were disorganized. We were very excited to have a corner booth, but with it came being 6 inches from the kitchen, where the door continually flung open next to us. The server was nice but too busy to provide good service. We were there for 3 hours. It took 45 minutes for us to get our food. When the food did come it came out in stages. Then it was another 30 minutes for the ice cream. The server was nice but the service was horrible. After all that I heard, my experience did not meet my expectations. The food was just ok. The service started off promising but wasn’t up to par. The restaurant ambiance left a lot to be desired. The booth seats were dirty and many chairs need replacing. We came for my son’s birthday and he had a good time. I guess that’s all that matters. However, Sugar Factory won’t be on my list to return. Great attitude by staff and we had a good time for my sons 13th birthday. Main complaint is that there were so many dirty tables around us that sat that way for most of our visit. We were only able to get a table at 3:45 which quite often is a staff switch over time which might explain the empty floor. 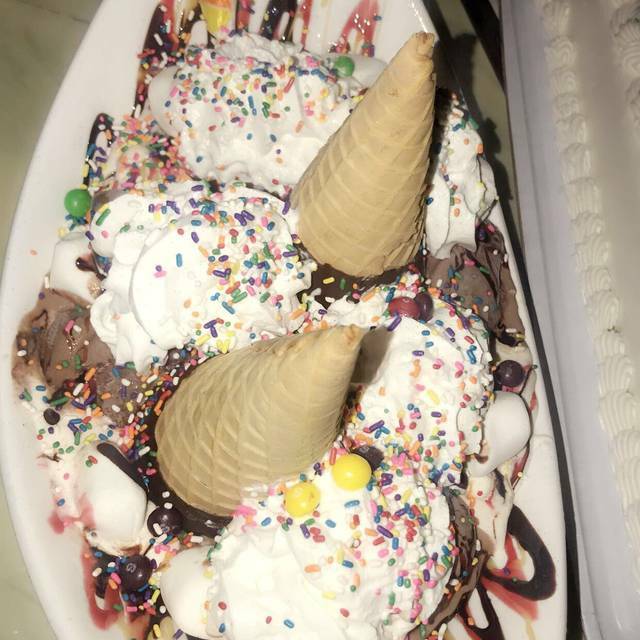 Desserts were over the top and worth every bite. Regular food underwhelming. To spend that much money and sit amongst dirty tables is unacceptable. Don’t make reservations for this late afternoon dead period. The service was amazing. Our server was very helpful in her recommendations. The food and drinks were playful and fun to experience. We had kids with us and they had a ball. The decor, I guess I was expecting more. 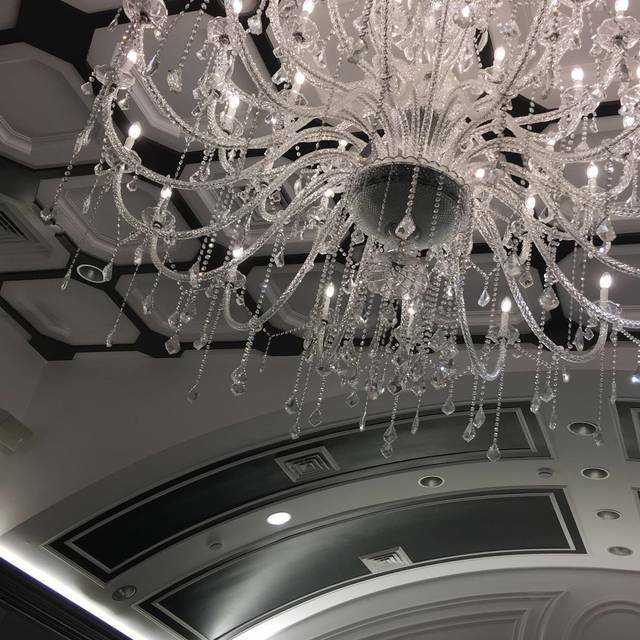 Like, a lollipop tree or candy tubes all around, and maybe a candy chandelier. The chairs and tables were sticky and had food on them. But, the most disappointing part was the candy dispensers were not full when we arrived. After we were done with our food they got a shipment and was blocked off so we were not able to purchase anything for our children. The kids were very disappointed and so we're we. Sugar Factory was the exactly right place to celebrate my daughter's 11th birthday. Atmosphere was great and the food was good. Large portions. Service was a little slow but the restaurant was busier than I expected for a Wednesday evening. We'll be back!